I made the top one by sticking a couple of those nets which you buy oranges in on top of cartridge paper and putting tissue paper on top; it was then stuck down with pva. 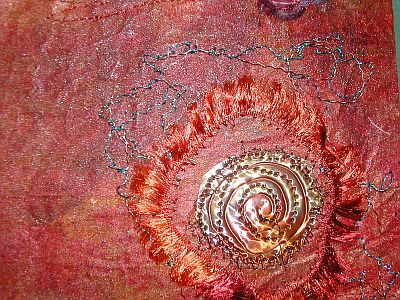 My second attempt at this is more successful than the one I made in the embroidery class – you have to get the right amount of pressure on it to reveal the texture without taking too long or the tissue paper rips. 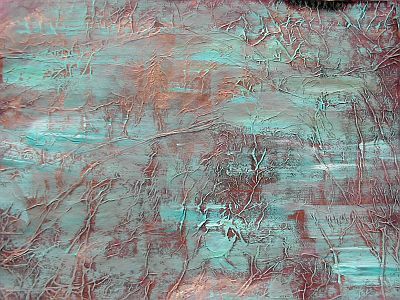 I painted it when it was dry. The next one is something I made ages ago when I was making covers for a folder for City & Guilds. I painted the blue layer on top last week so it toned in better with the rest of the colour scheme. (Hopefully!… we shall see when I start putting the squares together!). It is tissue paper over ordinary paper, glued down and painted and then brushed with gold Markal when the PVA was dry. Then painted blue to add a bit more depth. Or whatever. I started making this in the embroidery class – it was meant to end up as a wallhanging but I didn’t like it so I chopped it into squares! Here are a couple of them. 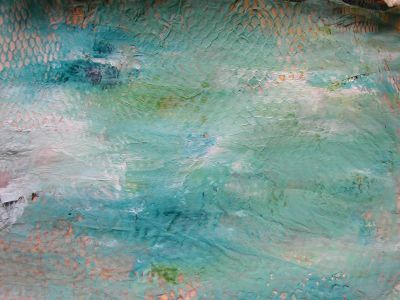 It is some more of the brown paper painted, crumpled and fused to calico, painted Bondaweb added and then a chiffon scarf ironed on top. Finally Markal was rubbed in to add to the texture. 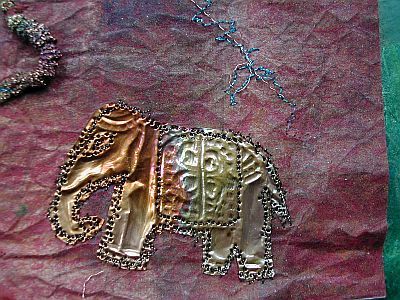 Then the metal shim was added – I rubbed this one over an Indian wooden block in the shape of an elephant, heated it to get the colours and sewed it on. I love the diversity and adventurous play in your work. I love seeing these types of pieces. I have played around a little myself but not as much as I would like to. Thanks for showing your work. You British Ladies are awesome! I love the elephant and the little squares and everything!